My daughter had the cutest bassinet. It boasted a brightly colored Noah’s Ark theme with giraffes, bears and tigers. Delicate ruffles bordered the edges. I couldn’t wait for my newborn baby girl to sleep in it. She, however, didn’t seem to care about the adorable design; she wanted to party all night. Sleep, I would soon learn, was not high on her priority list. As a new mom, I had no idea how crucial an issue getting sleep — for both the baby and the parents — would be. For some reason, I thought I’d gently lay her down in the comfy bassinet and she’d drift off to dreamland. Turns out I was the one dreaming! It was a long time before my precious girl learned that it wasn’t such a terrible thing to shut those little eyes for several hours. 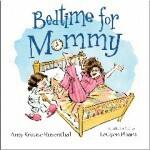 In the meantime, I began searching for books that would encourage her to sleep, or at least plant the seed of tiredness. “Goodnight Moon” quickly became a staple in my house and as my daughter got older it became even more fun to read together. I’d say, “Goodnight kittens. And goodnight … .” And she’d squeal, “mittens!” It became a sweet moment we both looked forward to, and I soon found that simply saying gentle, comforting verse or slowly telling a cheerful story helped lull her to sleep. I loved finding new books for us to read and even now, eight years later, she rarely slumbers off to sleep without first reading a few chapters of her favorite stories. Maybe all that reading early on has had something to with her nighttime routine, but no matter; for babies and toddlers, books have a way of magically easing the transition to bedtime. Ages 3 – 6. Candlewick. 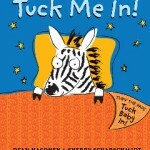 Kids will love tucking whimsical animals into bed with lift-the-flap blankets. The book begins: ‘It’s time for bed. Who needs to be tucked in?” A piglet says “I do!” and a pink “blanket” can be placed over his body. A playful way to end the night. A little girl puts her mommy to bed in this twist on the usual bedtime routine. The mom asks for five more minutes, two stories, and a glass of water, while her daughter cheerfully obliges. A sweet story with realistic watercolor illustrations. Baby Owl is stretching his wings, yawning and closing his eyes. 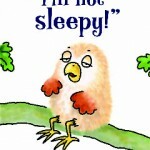 When his friends notice, they comment how sleepy he must be. 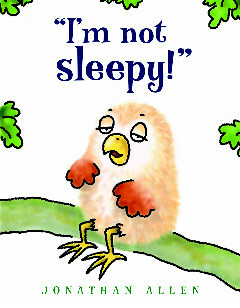 But Baby Owl insists “I’m not sleepy!” Irresistible watercolor illustrations and pitch-perfect toddler banter make for a fun read. 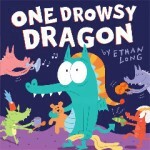 A tired dragon wants to sleep, but his dragon pals make a ruckus in this colorful counting book. One dragon clangs a cup, two dragons battle, three dragons tap dance, and so on, until he finally falls asleep. Baby Ted says he can’t go to bed because he’s not a baby. He pretends to be a crocodile, duck, frog, and other creatures, and his dad uses the opportunities to get him ready for bed. A cute story showing the love between a father and son. Mia Geiger is a freelance writer in the Philadelphia area. Visit her at miageiger.com. Thank you Jen and Mia. 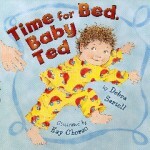 So happy to see my book, Time For Bed, Baby Ted on Momma Said Blog.